This project provides the schematic and the parts list needed to construct a 3V FM Transmitter. This FM transmitter is about the simplest and most basic transmitter to build and have a useful transmitting range. It is surprisingly powerful despite its small component count and 3V operating voltage. It will easily penetrate over three floors of an apartment building and go over 300 meters in the open air. It may be tuned anywhere in the FM band. Or it may be tuned outside the commercial M band for greater privacy. (Of course this means you must modify your FM radio to be able to receive the transmission or have a broad-band FM receiver.) The output power of this FM transmitter is below the legal limits of many countries (eg, USA and Australia). However, some countries may ban ALL wireless transmissions without a licence. It is the responsibility of the constructor to check the legal requirements for the operation of this kit and to obey them. 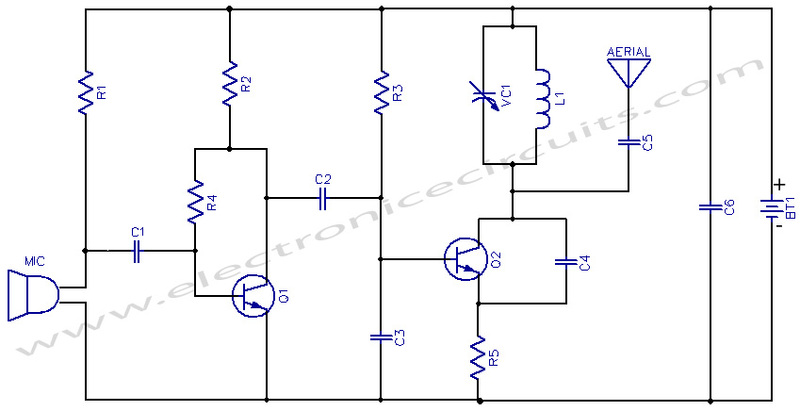 The circuit is basically a radio frequency (RF) oscillator that operates around 100 MHz. Audio picked up and amplified by the electret microphone is fed into the audio amplifier stage built around the first transistor. Output from the collector is fed into the base of the second transistor where it modulates the resonant frequency of the tank circuit (the 5 turn coil and the trimcap) by varying the junction capacitance of the transistor. Junction capacitance is a function of the potential difference applied to the base of the transistor. The tank circuit is connected in a Colpitts oscillator circuit. The electret microphone: an electret is a permanently charged dielectric. It is made by heating a ceramic material, placing it in a magnetic field then allowing it to cool while still in the magnetic field. It is the electrostatic equivalent of a permanent magnet. In the electret microphone a slice of this material is used as part of the dielectric of a capacitor in which the diaphram of the microphone formsone plate. Sound pressure moves one of its plates. The movement of the plate changes the capacitance. The electret capacitor is connected to an FET amplifier. These microphones are small, have excellent sensitivity, a wide frequency response and a very low cost. 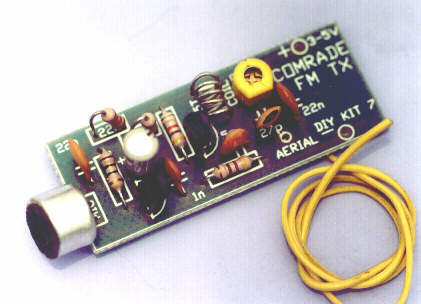 First amplification stage: this is a standard self-biasing common emitter amplifier. The 22nF capacitor isolates the microphone from the base voltage of the transistor and only allows alternating current (AC) signals to pass. Components may be added to the PCB in any order. Note that the electret microphone should be inserted with the pin connected to the metal case connected to the negative rail (that is, to the ground or zero voltage side of the circuit). The coil should be about 3mm in diameter and 5 turns. The wire is tinned copper wire, 0.61 mm in diameter. After the coil in soldered into place spread the coils apart about 0.5 to 1mm so that they are not touching. (The spacing in not critical since tuning of the Tx will be done by the trim capacitor. It is quite possible, but not as convenient, to use a fixed value capacitor in place of the trimcapacitor – say 47pF – and to vary the Tx frequency by simply adjusting the spacing of the coils. That is by varying L of the LC circuit rather than C.) Adding and removing the batteries acts as a switch.Connect a half or quarter wavelength antenna (length of wire) to the aerial point. At an FM frequency of 100 MHz these lengths are 150 cm and 75 cm respectively. Place the transmitter about 10 feet from a FM radio. Set the radio to somewhere about 89 – 90 MHz. Walk back to the FM transmitter and turn it on. Spread the winding of the coil apart by approximately 1mm from each other. No coil winding should be touching another winding. Use a small screw driver to tune the trim cap. Remove the screwdriver from the trim screw after every adjustment so the LC circuit is not affected by stray capicitance. Or use a plastic screwdriver. If you have difficulty finding the transmitting frequency then have a second person tune up and down the FM dial after every adjustment. One full turn of the trim cap will cover its full range of capacitance from 6pF to 45pF. The normal FM band tunes in over about one tenth of the full range of the tuning cap. So it is best to adjust it in steps of 5 to 10 degrees at each turn. So tuning takes a little patience but is not difficult. The reason that there must be at least 10 ft. separation between the radio and the FM transmitter is that the FM transmitter emits harmonics; it does not only emit on one frequency but on several different frequencies close to each other. You should have little difficulty in finding the Tx frequency when you follow this procedure. Class C amplifiers; FM transmission; VHF antennas; positive and negative feedback; stray capacitance; crystal-locked oscillators; signal attenuation The simple halfwave antenna used in the project is not the most efficient. Greater efficiency may be gained by connecting a dipole antenna using 50 ohm coaxial cable. Connect one lead to the Antenna point and the other to the earth line. You may experiment using 6V or 9V with the circuit to see how this increases the range of the transmitter. The sensitivity may be increased by lowering the 22K resistor to 10K. Try it and see. Note that this FM transmitter is not suitable for use on your body, for example, in your pocket. This is because it is affected by external capacitance and the transmitting frequency drifts depending how close you are to it. Stray capacitance is automatically incorporated into the capacitance of the tank circuit which will shift the transmitting frequency. 5dFRIO I want to say – thank you for this! I wanna thaks for the good works, I want a transmitter circuit lower than 20cm range. HLQVOH I am always excited to visit this blog in the evenings.Please churning hold the contents. It is very entertaining. Hi to avoid antenna damping the oscillator shift capacitor C5 to a tap at 1 turn from the supply end of the tank coil L1 (I have used a 75cms length whip antenna. For 3Volt operation reduce Condencer mic bias resistance to 3.3K. C6 is a must use 47uF with 0.1 Ceramic disc in parallel. A good circuit. Nice quality. i need to shematic of negative ion generator . would u help me? HI!, im an electronics engineering student, this circuit is so good and it can also work with a 9 volt battery, try it…. and enjoy…… is there a russian gurl over there??? i am very enthusiastic to make such use full circuit . please send me new updates of the electronics world. 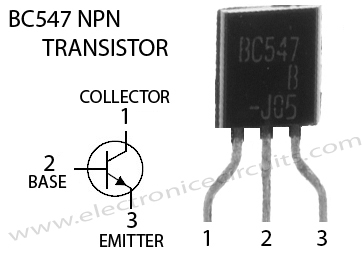 What are your thoughts on using a 2N3904 NPN transistors? Not enough gain? If i would like the FM TX operate in 40.xxMhz, which parts in the circuit should i focus? why is the aerial so long like 165 cm its very long?? Send me this 3v Fm transmitter coil number 14.18.22. 28? a master piece…………….. Thanks….. can i modify it to a gsm cell phone jammer?????? jus by changing the no. of turns of inductor and varying the value of vc1???? Having problem in tuning……………….. what can i Do? how to make the frequency at 80MHz?? what is needed to be changed?? can I use the transmitter circuit for the 76mhz operation?How it is done using the circuit? I connect them all together but nothing happens.what is prrobably wrong ? How change mic with audio source,same as mp3 player? May I know what is C3 for though? 2 Pings/Trackbacks for "3V FM Transmitter"